A lot of people have seen most of Steven Spielberg's movies, but how about most of Tye Sheridan's movies? I might have you there; I've been watching this kid grow into an actor since he was a teen, including some of the more random films he's appeared in. The Tree of Life, Mud, Joe, Entertainment, Last Days in the Desert, The Stanford Prison Experiment, Scouts Guide to the Zombie Apocalypse, Detour, X-Men: Apocalypse; that's quite the filmography for a twenty-one year old who has only been acting over the past seven years. He's actually on a bit of a down turn, becoming a bit awkward as he's grown up and not delivering his best performances in his most recent films. Ready Player One is his chance to shine in a movie that was guaranteed to be a big success, based on its director, best-selling book, and pop culture references. And yet Sheridan ends up as one of the weakest parts of a blockbuster that leaves its origins behind and suffers because of it, wows us with wide-eyed entertainment but forgets to stay grounded when tempted to be silly. In the near future, the world will run out of energy, our population will explode beyond containment, governments will collapse, food will become scarce, but life will still grind on, even if happiness no longer seems an attainable goal. The only bright spot of this grimy picture is James Halliday and his wondrous creation, OASIS. It's a virtual world in which anything is possible, where kids can go to school, where the crafty can make a real buck, where you can live out your wildest fantasy while your actual body stays in the common city slums. Everyone uses OASIS, and when Halliday dies without an heir, he announces through video that one user will become the owner of the entire company, an overnight billionaire. But first you have to win the game that he created, a test of sorts with multiple levels and puzzles galore. It's based on Halliday's favorite things, his life, his references, and you'll have to know pop culture history front and back if you're to have a chance at winning the greatest prize in the universe, and the chance to completely change your life. For Wade Watts, this game is everything, his entire life, how he spends every waking moment, and losing is not an option. Yes I read the book, no I don't think that ruins my chance to enjoy the movie. I am able to separate the two, while still judging the way they both handle the base idea. Ready Player One as a novel is shockingly bad. It's amateur, Cline has no talent for dialogue, he writes like a kid who won a literary contest at his school, and I don't know how anyone with any taste can take it seriously. What I do understand is how the 80s nostalgia he presents absolutely saves the day; it's that jam packed with awesome references, you'd ingest anything, no matter how terrible, if it made you feel so wonderfully nostalgic. The movie version does the same, laying badass fictional characters and cars and games and music at your feet until you're ready to worship whoever it was that brought it all to you. My only problem with the pop culture was that it expanded outside the 80s, which was Cline's whole deal, Halliday's whole obsession. 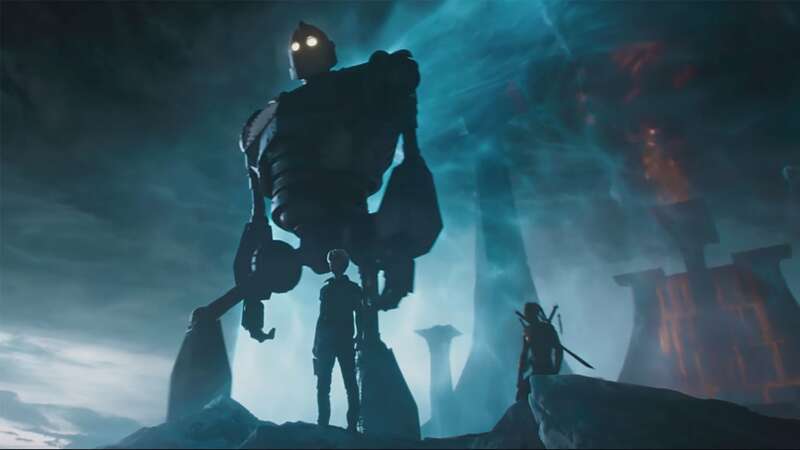 I think the book did the same a little, but not to this extent, Spielberg seemed OK with adding things like The Iron Giant and Halo when that wasn't what the story originally focused on. He also dumped a lot of the movie nods, which was odd, maybe he couldn't get the rights. Blade Runner, Ladyhawke, WarGames, The Holy Grail; these were big players in the book, but were completely absent from the film. I understand that there will be differences (keep an ear out for a bit of Excalibur in this one), but that's pretty major. Even judging Ready Player One as a stand-alone feature, there are still problems, mainly from an acting standpoint. The characters spent a lot of time in the "real world" and were exposed there for being fairly hollow, for not being supported by high quality actors. Sheridan is slipping; I don't think he's matured into the pro we thought he would be by this point. Cooke was fine, but once again, much better as an avatar than as a human. The only one to hit the nail on the head was Mendelsohn; duh, he's basically a genius. His scenes were great, but everyone else was better in the OASIS. The first half of the movie, which often took place in virtual space, was pretty awesome, the animation going above and beyond. It was exciting, hilarious, cooler than the other side of the pillow, everything you could ask for. The second half relied on the actors too much, got a little cheesy, and faltered, but by that point I assume most of the audience had completely bought in. Even the silliness could be explained away; 80s stories and villains aren't usually very complicated, so why should this one be? Ready Player One might be more fun than fantastic, more entertaining that excellent, but that's not a real knock, that's likely what you were in the theatre to experience. I'm most curious to see how fans of the book find the movie, whether they are put off by the changes, or whether they can roll with Spielberg's version. I only wish he had spent more time in the dungeons of the contest and in the virtual world all together; that's where the plot ran the smoothest, where the highlights happened, and what would draw my back in for a second watch. Order "Ready Player One" now!